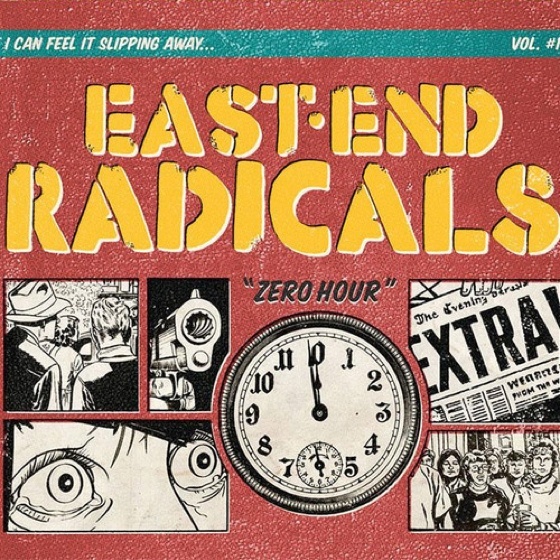 Montreal street-punks East End Radicals have delivered an eager attempt to emulate the political punk sounds of the late '90s and early '00s, drawing from Celtic and Oi!-infused bands like Flogging Molly and Dropkick Murphys with their latest LP, Zero Hour. The set consists of songs that rely on simplicity and the straightforward power chord-pairing nature of the subgenres that are channelled here, but in most cases, the effect loses its charm early on, resulting in songs that sound uninspired. For the most part, choruses fall short due to awkward hooks and out of place key changes, in addition to gang-vocal abuse. The numerous attempts to bolster sections using gang vocals end up backfiring, making the effect seem predictable and oversaturated.